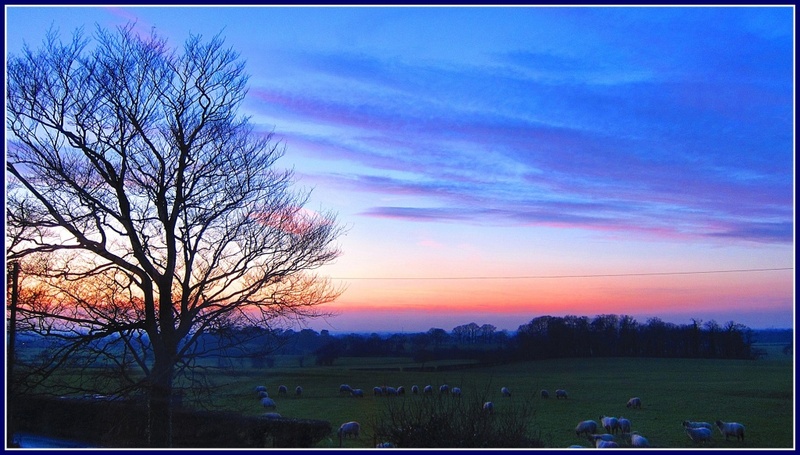 This is a shot taken from my grandson Jack's bedroom window late this afternoon. It is my first HDR photo & using Jacks small tripod on the windowsill. Lovely frosty skies & the sunsets have been magnificent. Wonderful colours and I love the composition with the sheep in the foreground. Lucky Jack to have a view like this! Yes - lucky Jack! What fabulous colours and it's lovely to see the sheep gathered in close... HDR eh? I'm going to have to get with it!! this is lovely!! the colors are brilliant. fav for me. beautiful.. love the tree and the sheep.! Love this view, it is so similar to mine for today (minus the sheep). Lucky Jack. A fave for me Pat - wow! This view is stunning. Does Jack live near you? @judithg Jack did help a little telling me how to go about it Judith but that's what grandsons are for aren't they ? @stepheesue Thanks for the fave Stephanie !! @murnane Thank you for the fave Marg ! Jack lives 10 miles from us so very handy to visit ! @phil_howcroft Well nothing too difficult Phil only the HDR option on my camera !!! Now isn't that lovely - what beautiful colours - well done on the HDR/tripod stuff. WHat a gorgeous view. I have to agree cold and clear makes for wonderful photo's, just a shame it's too cold to stand out there for any length of time to take them!!! Lovely scene Pat! Great colours! @shutterbugger No Jenn Henry lives at our house ! He is getting a new shelter tomorrow too !! Absolutely beautiful scene and colors, Pat! Love the use of HDR to give this a little extra pop. I'm envious of Jack's bedroom view! Brilliant! Lovely colors! Love it. . .
What a gorgeous view Jack has! Colors are wonderful. It's a beautiful view, Pat. Congrats also on your first HDR. I've never tried it except for using simulated HDR. Very nice. Must try this HDR thing sometime.